April 22 marked a new station of the series of events titled "Liszt! In Every Respect", taking place in the Festival Theatre of Palace of Arts in Budapest. The last event in the sequence of concerts presenting the major phases of Ferenc Liszt's life featured an outstanding concert titled "The Spirit of the Piano", performed by pianists Gábor Csalog and András Kemenes. The performance was mainly based on the later works of Liszt. Spirituality had always been a significant part of the famous pianist's life. At the age of 15, he seriously considered entering the Church but his father, Ádám Liszt who had already left the holy orders, dissuaded his son and encouraged him to help people find God through art. This is what became Ferenc Liszt's motto for the rest of his life. However, in 1865 he took on lower-ranking clerical orders and was ordained abbot. He was closely related to the Franciscan Order through the monks of the franciscan church in Pest. Besides Liszt's expressively ecclesiastical works (masses, oratorios), many of his less famous piano pieces feature spiritual themes or sentiments. Entering the stage in front of the sell-out crowd of Palace of Arts, Gábor Csalog started by announcing a change of program; instead of "Aux cyprés de la Villa d’Este", the piece titled "Miserere d’apres Palestrina" was performed. 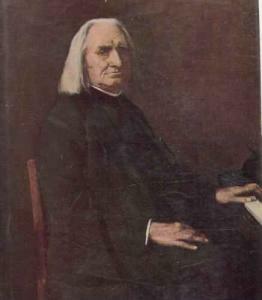 It was a significant and logical step to include Palestrina, since Liszt was an expert in the Italian composer's works. 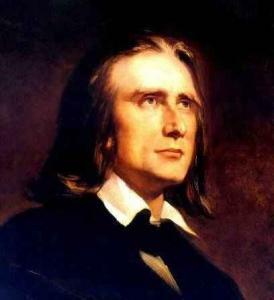 Liszt's goal was to reform sacred music the way Palestrina did. While in Rome, visiting Pope Pius, he came forward with his ideas and at first, he had the church's support, but was turned down later, perhaps because of his unusual sound that was too modern that time. A significant part of the Hungarian composer's collection of studies on Gregorian music can be found at the Ferenc Liszt Memorial Museum an the Old Academy of Music. The concert had a relaxing, meditative atmosphere. Unfortunately, I sat on the right side of the auditorium making it impossible for me to see the players' hands. Instead, I focused on the feet and the faces which also offered a lot of insight. The large blue background was remarkable, hinting at theendlessness of the sky. I felt like I'd been on a strange time travel; the age of Liszt integrated into today making the differences between the centuries insignificant. It was like a musical seance sucsessfully channeling the essence of Liszt's spirit. All this was followed by a more tense, ghostly 'night music', titled "Schlaflos! Frage und Antwort". Liszt composed this nocturne in 1883, based on a poem by Toni Raab. Next, "Pensée des morts" was performed. Just like "Miserere d’apres Palestrina", this piece is one of the 10 pieces of the cycle "Harmonies poétiques et réligieuses". Composed in 1834, this was the original title of the suite as well. It also includes the psalm "De Profundis" in its middle section. The audience was completely silent during most of the performance. I really liked that there was no applause between the pieces. Gábor Csalog's solo 'passage' was the only part after which the clapping slowly started. The audience felt how badly the silence created by the music would've been broken by the noise of applauding. Then, András Kemenes took the stage, playing "Sursum corda" first. This is the closing piece of the suite titled "Années de pèlerinage. Troisième année. ", about the euphoric glimmer of hope. Liszt's works composed in Villa d'Este have strong depressive overtones. He spent his evenings, even nights sitting in the darkness under cypresses and he even considered suicide. This piece was also composed there, in 1887. To quote Liszt's own words: "I again started to stain the staves and wrote four pages. The title is Sursum corda. These pieces aren't made for salons, they aren't entertaining or enchantingly beautiful. I will warn the publisher he'd be able to sell only a couple of copies." Still, this piece at the end of the suite reflects an atmosphere of exaltation. Performed next were the monumental variations on "Weinen, Klagen, Sorgen, Zagen". This was the first piece of the night that was originally composed for the piano. Covering the theme of Bach's cantata, Liszt wrote a prelude in 1859, then a whole series of variations in 1862. The climax of the piece comes in the form of a chorale in the closing section: „Was Gott tut, das ist wohlgetan!” („What God does that is done well!”). It is like an enormous bridge with a huge arch, or a great improvisation, building itself towards the climax and then gradually calming down. The second part of the concert was entirely made up of the monumental work "Via Crucis" in a four-hand version. An interesting fact: the premiere of "Via Crucis" took place at the oldest church of Budapest, on the Good Friday of 1929. The piece presents the 14 stations of the Cross. The Roman Catholic Church wasn't pleased by it, perhaps because of two protestant elements: a chorale by Bach and a religious folk song. Gábor Csalog's face showed absolute pleasure while playing "Via Crucis" which is something that must have filled Liszt's every moment, regardless of what he played, a spectacular rhapsody or one of his later 'minimalistic' works. All his works have that crystal clear piano-culture only with less notes. No matter how 'clear-out' his works had become, he always played his more complex works and there weren't many pianists, even younger ones, that could match the old Liszt's virtuosity. He performed 140 times in 8 months – close to the age of 70. Moreover, he played better than his contemporaries even with his fingers injured, performing with only 9 fingers after an accident, without the audience noticing. According to the account on Liszt's playing by English writer Hugh Reginald Haweis, who had a chance to see him play in Rome: "he contracted his thumb and second finger to stress notes more, or pulled two fingers together, lifted them and in the middle of the melody, made a soft, touching gesture. It was as if he was conjuring the soul of the instrument, seemingly before actually touching the keys." 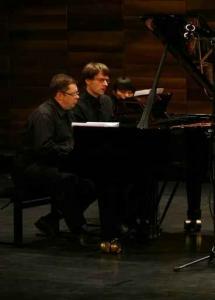 Both performers on the stage played magical, shining notes on the piano. Ending with the painful march of "Via Crucis", the concert's most defining element perhaps was the contrast of passion and calmness. Although Mephisto's tritones occured time and time again, the slowed versions of "Études d'exécution transcendante", the quiet forms of augmented chords in a meditative, introverted framing, made these echoes seem to come from beyond the grave. All pieces are strange mixtures of the worldly and the ecclesiastical. This concert wasn't about the performers and even less about 'performance', but an absolute humility towards the composer, yet with an intensive presence of the players. It was a perfect Good Friday devotion. Palace of Arts, Festival Theatre, April 22, 2011.